The main research on this axis has been developed through two international projects: KEOPS-2 and SAZ. KEOPS-2 project studies a naturally Fe fertilized phytoplankton bloom in the Southern Ocean (Kerguelen Plateau,). This seasonal bloom is dominated by diatoms, a group of algae that requires silicon to build their glass frustule. 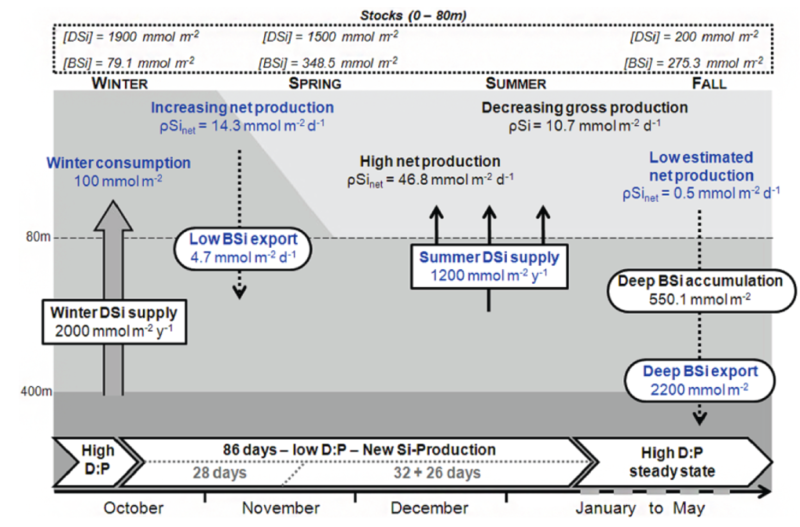 Our isotopic approaches of the silicon cycle highlight the importance of summer silicon supply to the mixed layer from below with a silica production regime that can be compared to upwelling ecosystems (Closset et al., 2014). New data from early summer together with previous works on the same region in late summer has allowed us to propose a seasonal budget of the silicon cycle above the Kerguelen Plateau, one of the specific objectives of MuSiCC. This budget includes winter and summer Si nutrient supply from below, bulk and net silica production as well silica export (cf. figure). 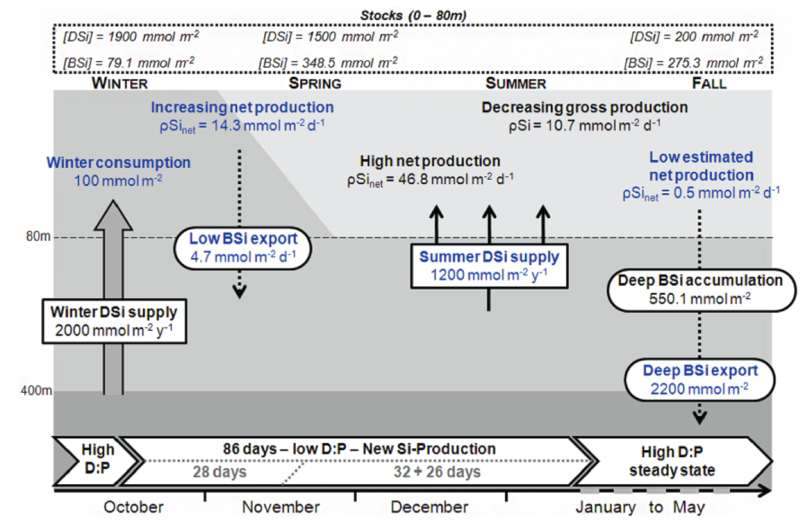 Schematic view of the seasonal silicon cycle in the mixed layer above the Kerguelen Plateau as estimated from natural and enriched Si isotopic measurements. Blue silicon fluxes correspond to estimated values while dark fluxes correspond to direct measurements. The three main water masses are represented in dark grey for Upper Circumpolar Deep Water (UCDW), medium grey for the winter water (WW) and light grey for the mixed layer (ML). Variation of biogenic silica and H4SiO4 standing stocks integrated over 80m (respectively, [Bsi] and [DSi]) are shown in the upper panel. Vertical continuous arrows represent DSi supplies from deep water to the ML, and dotted arrows correspond to particulate silica fluxes. Integrated silica production rates are calculated from the surface to 80 m. Horizontal white arrows represent the state of the bloom (indicated by the silica Dissolution : Production ratio) through time. (c) Closset et al. (2014) doi:10.5194/bg-11-5827-2014. We observe that the Fe-rich region is characterised by higher Si:N uptake ratios compared to HNLC area. This suggests that natural iron fertilization over long time scales does not necessarily decrease Si:N diatoms uptake ratios. Summer supply represents 38% of new nutrient Si supply and should not be neglected. In contrast to initial assumption, the silicic acid leakage hypothesis as one of the drivers of glacial – interglacial atmospheric CO2 changes cannot be justified by a change in Si:N uptake ratio due to increase Fe supply in glacials. CLOSSET Ivia, 2015. 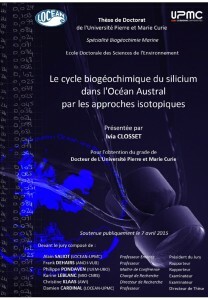 The biogeochemical silicon cycle in the Southern Ocean tracked by isotopic approaches. Geochemistry. Universite Pierre et Marie Curie – Paris VI, 2015. English. <NNT :2015PA066124>.<tel-01191669>. 256pp. This page lists all peer-reveviewed articles published by MuSiCC participants during its running period or after the end of the project as direct follow-up of MuSiCC activities. Blue color refers to publications related to Axis 1 and Green color refers to publications related to Axis 2. The activities of author(s) in bold have directly been supported by MuSiCC. 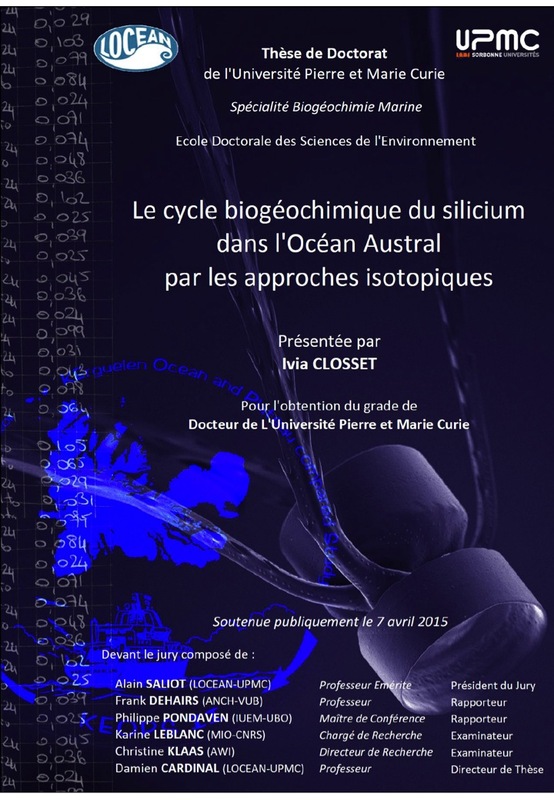 Closset I., D. Cardinal, S. Bray, F. Thil, I. Djouraev, A. S. Rigual-Hernandez, T.W. Trull, 2015. Seasonal variations, origin and fate of settling diatoms in the Southern Ocean tracked by silicon isotope records in deep sediment traps. Global Biogeochem. Cycles, 29, 1495-1510. Cavagna A.J., F. Fripiat, M. Elskens, F. Dehairs, P. Mangion, L. Chirurgien, I. Closset, M. Lasbleiz, L. Flores-Leiva, D. Cardinal, K. Leblanc, C. Fernandez, D. Lefèvre, L. Oriol, S. Blain and B. Quéguiner, 2015. Production regime and associated N cycling in the vicinity of Kerguelen Island area, Southern Ocean. Biogeosciences, 12, 6515-6528. Rigual-Hernández A., T. Trull, S. Bray, I. Closset, L. Armand, 2015. Seasonal dynamics in diatom export fluxes to the deep sea in the Australian sector of the southern Antarctic Zone. Journal of Marine Systems, 142: 62-74. Campagne P., X. Crosta, M.-N. Houssais, D. Swingedouw, S. Schmidt, A. Martin, E. Devred, S. Capo, V. Marieu, I. Closset, G. Massé. 2015. Glacial ice and atmospheric forcing on the Mertz Glacier Polynya over the past 250 years. Nature Communications, 6, 6642. Mawji E. and The GEOTRACES group, 2015. The GEOTRACES Intermediate Data Product 2014. Marine Chemistry, 177, 1-8. Jacquet, S. H. M., Dehairs, F., Cavagna, A. J., Planchon, F., Monin, L., André, L., Closset, I., and Cardinal, D., 2015. Early season mesopelagic carbon remineralization and transfer efficiency in the naturally iron-fertilized Kerguelen area, Biogeosciences, 12, 1713-1731.